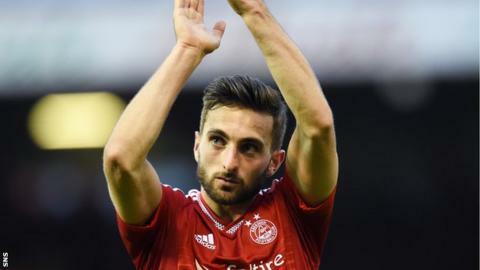 A summer move may have caused Graeme Shinnie to enter the Europa League qualifiers at an earlier stage but the Aberdeen player insists it has only enhanced his first foray into continental competition. The 23-year-old captained Inverness Caledonian Thistle to Scottish Cup final success against Falkirk in his last game for the Highlanders before a switch to Pittodrie. Part of their reward for that victory at Hampden Park was advancement to the second round of Europa League qualifiers while Shinnie's new club had to negotiate a tricky first hurdle. However, Shinnie could not have been happier as he was desperate to experience different playing styles after being limited to domestic football at Inverness. Now he and his Dons team-mates are in Croatia preparing for their first-leg tie against HNK Rijeka having seen off Shkendija of Macedonia on away goals in the first round. Derek McInnes's men are probably underdogs against a team who are unbeaten at home in their last 12 European ties. That run includes meetings with Stuttgart, Real Betis, Standard Leige, Lyon, Feyenoord and current Europa League winners Sevilla but Shinnie is undaunted by that record. He is determined to extend his stay in continental competition and hopes Caley Thistle can do likewise now they have finally made it as well. "I loved every minute of both matches in the last round. It was my first time ever playing football in a foreign country," he explained. "Inverness never went away during pre-season and I had never played in a European tie before [facing Shkendija]. "It was brilliant to finally experience what that was all about. I also got a thrill out of the return match at Pittodrie. It was my first game there for the club, so it meant a lot." Shinnie excelled in midfield as Niall McGinn scored the decisive away goal in Skopje. That 1-1 draw was followed by a hard-fought goalless return leg at Pittodrie with Shinnie once again a stand-out but in his more regular left-back berth. Only McInnes knows where Shinnie will feature in the Stadion Kantrida on Thursday but the player himself is happy wherever that turns out to be. "People often ask me where I prefer to play but I'm happy to go in wherever my manager feels is best for the team," he said. "I genuinely love playing in midfield as much as I do at left-back and if I was asked to play in another position for Aberdeen I would be happy to give that a go too. "I'm content as long as the manager feels I'm good enough to be put out on the pitch. "It's then up to me to go out and perform as best as I can to make sure he keeps picking me." Only Mark Reynolds, recovering from shoulder surgery, was missing from the travelling party that left a dull and drizzly Aberdeen for sunny Croatia. The temperature was 36C on arrival in Rijeka and it's not expected to be much cooler at kick-off time, which McInnes admits puts extra demands on the players. Despite that, the Aberdeen manager is confident they can still make it unlucky 13 for a team that have reached the group stages of the competition for the last two years. "We always aim to win any game and there are different ways of doing that," the manager said. "We will play a system that will hopefully let us do that. "They have a powerful team with good individual talent so it is a step up in opposition but we have shown we are tough. "We beat Groningen away from home last season, which shows what we are capable of and we are confident we have the players who can manage the tie over two legs. "The heat is something we do have to take into consideration though and we must make sure we maintain that competitive edge throughout." Aberdeen will have the backing of 300 members of the Red Army for one of the last matches to be played at the Stadion Kantrida, an old-fashioned Eastern European ground with a running track around it. The venue is just weeks away from being demolished to make way for a new 14,500-capacity stadium due to be complete late next year. In the meantime they will move to a smaller ground built nearby, which is part of a new training complex. The relocation has come about since Italian oil magnate Gabriele Volpi took a controlling interest a few years back. It's the progress on the pitch that will concern Aberdeen though as the team is packed with Croatia, Bosnia and Slovenia internationals. Their manager, Matjaz Kek, steered Slovenia to the 2010 World Cup in South Africa, where they finished third in their group behind the United States and England. He has already demanded a much improved performance from his current players who he criticised heavily after the 0-0 draw away to newly-promoted Inter Zapresic following their opening league game last Friday. His problem is replacing Andrej Kramaric who, despite being sold to Leicester City for £9m last January, still finished top scorer in the Croatian First League with 21 goals. Aberdeen proved the importance of away goals against Groningen last season and Shkendija this term. And there's an added incentive to repeat that in the port city on the Adriatic coast as victory over the two legs would secure a seeded place in Friday's draw for the third qualifying round.